At ISE 2016 in Amsterdam this week, Epson introduced its new Pro L-Series large venue laser projectors, including what it says is the world’s first 3LCD projector with 25,000 lumens of color brightness and 25,000 lumens of white brightness. The Pro L-Series projectors are also the first to integrate a laser-light source with an inorganic phosphor wheel in combination with inorganic LCD panels. 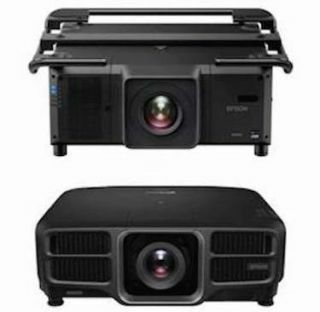 Assembled with Epson’s proprietary 3LCD technology and new inorganic components, the Pro L-Series laser projectors are built for performance, quality, reliability, and flexibility. The Pro L25000 features 25,000 lumens of color and white brightness and a wide range of 4K-compatible lenses, while Pro L1000-Series comes in six models ranging from 6,000 to 12,000 lumens, and offers nine optional lenses, including the world’s first zero-offset ultra short-throw lens. The 3LCD laser projectors offer several advantages for large venue installations, including a highly efficient light engine; LCD panels and a phosphor wheel made of inorganic material with superior light and heat resistance; and support for 360–degrees installation, edge-blending, stacking, portrait-mode projection, mapping, and a variety of lens options. The Pro L1000-Series will start shipping in July 2016, with pricing announced prior to launch. The projectors come with a limited warranty of three years or 20,000 hours, whichever comes first, with next business day replacement, including free shipping both ways. For additional information, visit www.epson.com/projectors. The Pro L25000 will ship in late 2016 with full specifications, pricing and warranty details to be announced prior to launch.